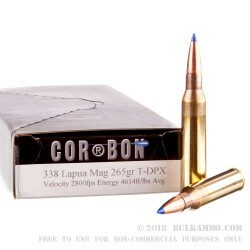 This 338 Lapua Mag cartridge by Corbon features a 265 grain projectile. The polymer tipped solid copper bullet travels at a muzzle velocity of 2,800, which combined with its metal’s superb momentum and weight retention provides penetration that is certain to deliver the knockdown power you need to take large game including deer, elk, caribou, and buffalo. 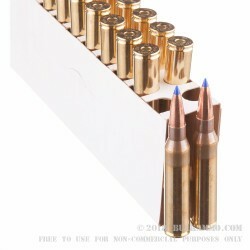 Hogs aren’t remotely fond of this cartridge, either. If you hunt in California, then you’re intimate with the state’s strict moratorium on toxic ammunition. 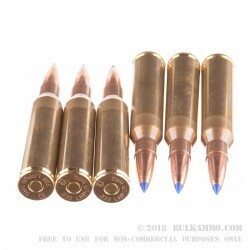 This copper bullet complies with the state’s environmental laws completely, so you can focus on your aim without fear of a game warden tapping on your shoulder. 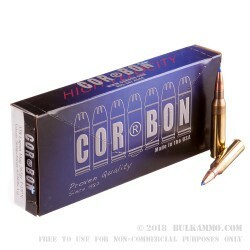 Corbon emphasizes their staunch commitment to quality control, and strictly adheres to their proven manufacturing processes in everything that they do. As such, they only offer cartridges that they can confidently back with their 100 percent satisfaction guarantee.